Women in India running their own businesses find that mentoring helps them address new challenges. A woman entrepreneur shares her story. Before I moved to Bangalore (after my marriage), I had been running my business for a year and a half. I had a team of 4 people at ideaPerfect Communication and during that time, I experienced many challenges such as managing a cash crunch, time management, team management, client handling and building a company culture. At this stage, I felt that I needed to share my plans of growth and expansion with somebody, and at the same time wanted to discuss certain business questions that I felt I needed guidance on. I already knew the problems and pain points in my business and also my own shortcomings, but I had no clue on how I could organize/arrange things better. Since I had to close my unit in Kolkata and restart my work in Bangalore, I decided to use my time to not only explore the business culture and opportunities in Bangalore, but also find solutions to the problem and difficulties I experienced. While one can talk to friends and family, there are times when you feel they are judging you or sometimes you don’t feel like sharing all your challenges with them; but with a mentor, the relationship is different. The entire relationship is based on a system where we know that we are both here to discuss challenges and shortcomings, mine as well as that of my business – and to explore solutions for the same. I connected with my mentor through the Goldman Sachs 10000 Women program with ISB. I joined the program because I wanted to understand how other people look at business and business problems. I felt this was critical for me since I come from a design background and my understanding of business comes mainly from my exposure to others running businesses in my family. ISB was a great platform to understand how business owners interpret the same problem in a different manner and derive solutions accordingly. The 10000 Women program is 3-month program where we have 3 weeks of classroom sessions in all, 1 week per month. We were assigned mentors during the first week and for the rest of the program we were to connect with our mentors and develop our business plans. My mentor is Gopa Kumar, a soft skills trainer and a visiting faculty at ISB. I connect with my mentor once a month for an hour or two and apart from that, we talk on the phone as and when required. In times of emergency, he does give me more time. I soon realized that Gopa was very different from me. I am more of a technology person while he keeps himself away from technology as much as possible; I come from a design background and he has nothing to do with that industry. But, the beautiful thing in our mentoring relationship is that when we brainstorm together, we write down our pointers and then discuss the same with an open mind and heart. Since he does not come from my industry, his glass was empty, as in, he didn’t have any preconceived notions about my industry problems and would explore them in his own way. This leads to more learning. Having gone through the experience of receiving mentoring, I feel the challenge in mentoring is to set the correct expectations. People think mentors are supposed to hold their hand and tell them what to do with their business, but it doesn’t work like that. In a mentor mentee relationship , it is the mentee who should drive the relationship and learning curve. People think mentors are supposed to hold their hand and tell them what to do with their business, but it doesn’t work like that. The real mentoring is where your mentor leaves you with questions and suggests other paths for you to explore. He or she is not supposed to tell you what to think or foist her own thoughts on you. A mentor is meant to listen to what you have to say and to your questions and then leave you with a question to answer the same. He is a sounding board where you can go and talk and never feel judged. I feel that mentoring is definitely a tool that can be used by business owners (Read, Getting The Best From Mentoring In The Workplace), especially if they are the sole decision makers on their business and feel like sharing their challenge and growth plans with someone else. It is a way to reach someone who does not judge you, but listens to you with 100% attention and interest and helps you reach the solutions to your business problems. About The Author: Ruche M Mittal has specialized in graphic design from Wigan & Leigh College, Kolkata. 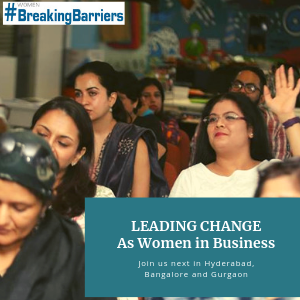 She runs ideaPerfect Communication , a design firm based out of Bangalore and is also the initiator of HEN India - Her Entrepreneurial Network, a network of 1000+ women entrepreneurs. HEN India – is a network for Indian women entrepreneurs to inspire, inform & support each other to create successful businesses with balanced lives.